I'm not an active member but i do read the forum. If i won this I would probably be more inclined to participate, so here is my post to enter!!! Same for me, I need one for my Dodge 2500! thanks so much for asking! 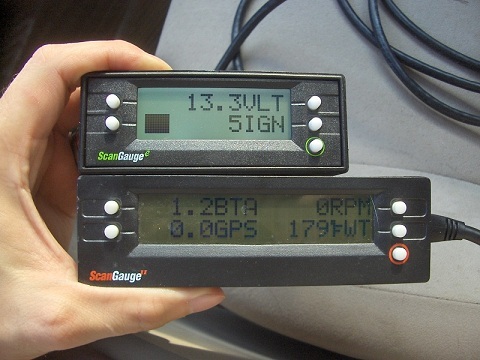 ScanGauge-e shown, top, and ScanGauge-II. Read Tim's comparison. A deserving forum member (redpoint5) had his name drawn for the SG-e in our last contest, but he has graciously thrown it back to us to be drawn again. So we're having one last draw! As before, to qualify to win, you just have to participate in the forum as usual. We'll draw 1 member at random who posts in any thread in the forum between 12:01 AM EST today (March 18) and noon EST on Monday, April 8. * NOTE: Only members who joined before today can win. The winning username will be announced in this thread. Winners must claim their prize within 10 days of the announcement (by contacting us via private message), or we reserve the right to draw another name in your place. We're not kidding - we've had to do this before. Forum participation generally tracks gasoline prices in the U.S., which means with current prices your odds of winning are near 11-year highs! 7 posts, you'll have to try harder! G'day, i would love a ScanGauge-e for my Smart forfour car. I would like to try a ScanGauge. I'd put it in my wife's car (already have a UG in my own car). I finally have something with OBD-II!! LOL, I know how you feel Frank...I finally rid of all my obd1 cars so now I can actually troubleshoot whats wrong based on failure codes with some degree of accuracy. Before it was a shot in the dark. I THINK im happy with the upgrade(?) to obdII...the trouble is it may help find trouble way more often than it needs too...been having fun and games with the old 'catalyst operating below efficiency' on wrxish and hate the thought of spending 800 on a new converter...yikes. But it is beginning to look like that is what will be required to keep the yellow light out and the cruise control turned on. Did I hear someone say something about pre obd??? Sounding pretty good right about now. Last edited by hotshoetom; 03-24-2019 at 06:30 PM..